Pick a sharp kebab stick - you may want to carefully sharpen it with a knife. Then push it out of the balloon through the thick part of the balloon opposite the neck. The first question is why does a balloon pop in the first place. The rubber in the sides of the balloon is as stretched as far as it can be so if you make a hole in the balloon all the force which should have been taken by the rubber you have broken is concentrated at the edges of the hole. This force is enough to break the rubber there, making the hole bigger increasing the force concentration, this tear keeps propagating until the pressure inside the balloon drops enough to release the tension. 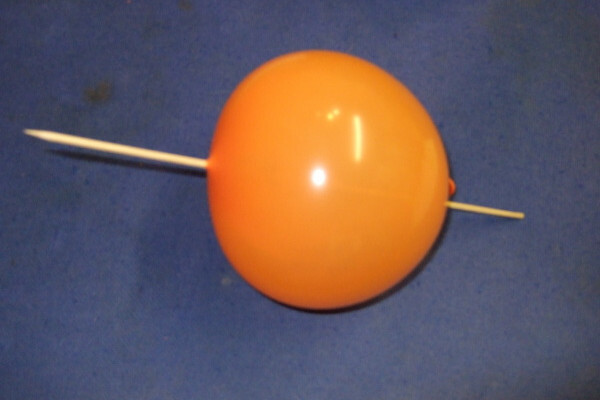 The rubber in a balloon is under lots of tension due to the air pressure inside stretching it. If you make a small hole in the rubber, all the tension that should have been supported by the rubber now around the hole is transferred to the edges of the hole. This force is much too large for the rubber at the edge to support so it breaks. This means that there is even more force on the edge of the bigger hole so the tear runs very rapidly across the balloon until enough air escapes that the tear stops. Why doesn't the balloon pop if you put the skewer in the ends of the balloon? If you look at a balloon carefully you will notice that the rubber around most of the balloon is extremely stretched, but at the top and bottom there is an area of thicker rubber. This means that the rubber at the edges of the hole can stretch significantly so the force is shared out over a large area and it isn't large enough anywhere to break the rubber. The rubber around most of the balloon is extremely stretched, but at the top and bottom there is an area of thicker rubber. This thicker rubber can still stretch, so if you put a hole in it the extra force at the edges of the hole will cause the rubber to stretch, this means that the force can be shared out over a large area and none of the balloon has to break. Why is the rubber completely stretched in some places and hardly stretched in others? Rubber behaves strangely when you stretch it, to start off with it is quite stiff, then as you stretch the rubber it becomes less stiff and then eventually very stiff. This means that the rubber in the balloon will either be completely stretched or hardly stretched at all, so you get the thin rubber in the sides and the very thick rubber at the top and bottom.